A simple, sweetly pungent glaze—made with fruit jellies and prepared horseradish—gives this roasted bird extraordinary flavor. Place turkey on roasting pan uncovered. Bake in a preheated oven at 325°F (160°C) until the temperature reaches 170°F | 80°C) in the deepest part of the breast. In a small saucepan, mix apple jelly, currant jelly over medium heat until warm enough to mix together. Add horseradish and remove from heat. Brush glaze over breast every 15 minutes during the last 45 minutes of cooking. 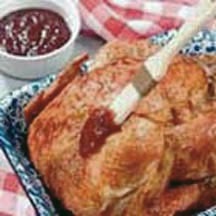 Serve remaining glaze with turkey.